Do you know if you're an Alpha, Beta or Omega female? Well, it's high time you found out because you certainly can't be a mix of the three. Sure, you might be a multifaceted human being with more layers than a Chili's Awesome Blossom and maybe you'd rather eschew labeling yourself as any extreme. It could be that you feel Alpha when you get angry, Beta when you're lazy and Omega when don't care enough to fight for something. You might take the lead in some circumstances and not others, both at work and in your personal relationships. Perhaps you — like pretty much every other person on Earth — would like the freedom to be more than a single thing at once, but that's too bad. You're female and by virtue of being female, you have to decide what kind of woman you want to be and, after the decision is made, you are not allowed to deviate from it. A debate between two of your choices (Alpha and Beta) has already begun at the Telegraph where author Byrony Gordon wrote The Full and Fearless Guide to Not Having It All, a celebration of the "Beta Woman," i.e. a lady who is too tired or disinterested to join Lean In circles, doesn't wear power heels and struggles to follow a GOOP approved diet. Meet Beta Woman. She is someone I dreamt up with my friends and colleagues, though the chances are that you have thought of her, too. You have probably met her. You most likely know her. In fact, if you have two X chromosomes, you probably are her. Beta Woman is: Busy; Exhausted; Topsy-turvy; All over the place. She long ago stopped trying to juggle balls; she spends her time cleaning them off the floor. Her life is – for want of a better phrase, because the kid had me up at 3am – sublimely sub-standard. But the Beta Woman isn't the only one with a champion over at the Telegraph. Writer Caroline Kent, a self proclaimed "Alpha woman," is here to present her own one-dimensional type for broads to emulate. I was recently described as being "not girlfriend material" and I blame the fact that I'm an Alpha woman. I'm strong, empowered, confident, and successful. I'm also hard to impress, high-maintenance, volatile, easy to bore, and - shockingly, I know - single. Of course, there's a chance that Kent's relationship status is more tied to that whole "high-maintenance, volatile" thing than it's about her being empowered and successful, but what do I know of this Alpha womanhood? I mean, I've also been told that I'm "not girlfriend material," but that, unfortunately, had nothing to do with my success and everything to do with my weird feet and terrible personality. I CAN'T RELATE. But back to Alphas, Betas and Omegas! Alpha-dom makes dating hard. My standards are high, I'm unforgiving and often dismiss men without giving them enough of a chance, shooting myself in the foot. But to be defensive and standoffish comes naturally to an Alpha. In the animal world, it's just as likely that the Alpha in a wolf pack would be female as male. However, to acquire the status of Alpha, a female would have to kill a lot more other wolves than a male would. Furthermore, to avoid an Alpha-male rising, the Alpha female must have the ability to bully, dominate and even kill the Beta males who insist on attempting to mate with her or otherwise demonstrate their own Alpha status. Ergo, an Alpha woman eats Beta men for breakfast. You always win at tug-of-war. You get more attention from other dogs than the rest of your pack mates do. You HARDLY EVER lick another dog's mouth. You win EVERY staring contest. This is the [WOMAN] that I see more frequently in our Board and Train program. This is definitely the [WOMAN] that challenges the companion [WOMAN] owner over and over. Quite often, the Beta [WOMAN] is also very dominant...The Beta [WOMAN] may be barky, mouthy, reactive, and unwilling to accept the human as its leader. This [WOMAN] spends its life, if untrained; challenging every day any form of control. These [WOMEN] are quite often, given up to Breed Rescue or to Shelters, as they are "too much" for many [WOMAN] owners to handle willingly. Quite often in [WOMAN] play, they cause fights by playing too rough or intense, they do not read nor accept other [WOMAN]'s body language. 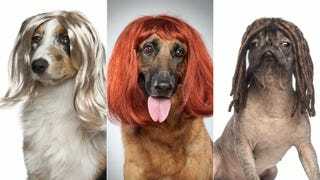 They may be clearly possessive of prized items such as toys, rawhide, food, or even fighting to get all the attention from their owners in a multi [WOMAN] household. Remember the Beta [WOMAN] can be dominant, but not necessarily a leader. This [WOMAN] wants to be the leader of a pack, but may not have the skills to be a true leader! "[The Omega] have a privileged status, because their duty is to soften tensions and solve disputes between others: for this reason, among wolves they enjoy some very interesting privileges. For example, they eat last, it's true, but they eat valuable parts of the pray, left there especially for them. and pees itself when nervous. I KNOW I FOUND MY MATCH. Please find yours while I go change my very wet diaper.